Our parting shot for this Friday is about the state of the Internet, and it offers some food-for-thought in light of our earlier commentary this week on the United Nations Internet land grab that's underway. For our clients and interested readers alike, we try from time to time to help you stay abreast of facts and figures about the growth, adoption and innovation of the Internet. Our CTO offers up this report today drawing from a recent presentation by Mary Meeker, a partner with Kleiner Perkins Caufiled & Byers (KPCB), a venerable leading venture capital firm based in the heart of the Silicon Valley. Mary made her annual presentation that tracks the growth of the Internet last May and updated it during a presentation at Stanford University last week. To summarize in a sentence: The data is stunning. without a doubt, the connective tissue of human interaction across the Internet will be mobile in nature, or said differently, the desktop is rapidly diminishing to an inconsequential access means. With that let's look a litte deeper and we offer the 88 slides presentation below for you to peruse on your own. And you should. 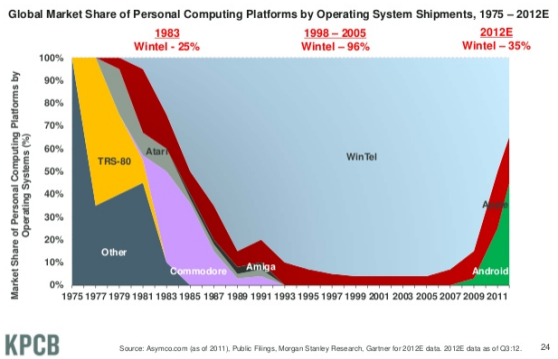 First, Mary's data (as well as other sources) suggest a notable shift away from Windows-powered Intel machines (so-called "Wintel" platform) in the past few years. However, another way of interpreting her graph is that the device market expanded with new mobile and tablet categories. And accordingly, it can also be argued that the new market segments diluted the Wintel segment, rather than causing a shift away. Regardless of how you see it, Apple has managed to do what for years the pundits maintained could never happen: it has caused a fracture in the Wintel monopoly. Although Apple may have been the first rock into the Wintel windshield, it is Google's Android OS that’s causing the riples of crack lines across Microsoft's market hold. according to the Meeker data, since Q-4 2010, combined shipments of tablets and smartphones have exceeded the number of PCs shipped and that trend shows no sign of slowing down. There are now 2.4 billion Internet users worldwide, a number that’s still growing eight percent yearly. There are more than 1.1 billion smartphone subscribers worldwide — but that’s still just 17% of the global mobile phone market. 29% of U.S. adults now own some sort of an Internet-enabled tablet device. Mobile devices now account for 13% of worldwide Internet traffic, up from 4% two years ago. Mobile app and ad revenue has grown at a CAGR of 129% since 2008, and now has crested $19 billion USD. The KPCB presentation goes on to detail how these device and connectivity trends are leading to the complete re-imagination of everything. For our Clients we encourage a moment of reflection: how you create, establish, and sustain a relationship with your customers is also dramatically shifting. We think the underlying message here is "Go mobile, young man, go mobile." And when you look at this data, is it any wonder there is land grab food fight underway in the United Nations over control of the Internet going forward? That's our Friday Parting Shot, and hopefully it will feed your CRM strategic planning.